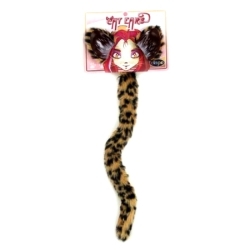 Easily create a cheetah costume with this cheetah ears & tail set. Set includes a pair of cheetah print fur trimmed plastic cat ears with a clear chin strap for a secure fit and an easy to attach plush fur tail. Remember to check out all of our other wild cat costume accessories to create your own custom cheetah costume this Halloween. Also great for use in a school play or just to let your child use their imagination.